Keep your gardening tools and outdoor items safe and secure in this Palram 6ft x 4ft Green Skylight Plastic Shed. 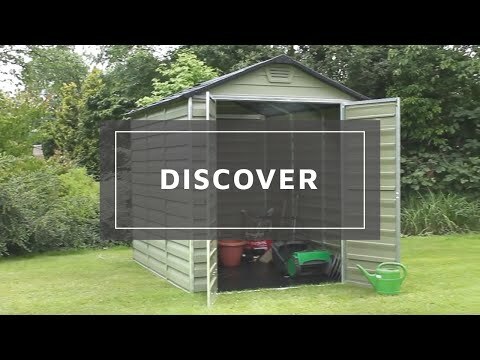 Designed to maximise your outside space, this small storage shed is suitable for even the smallest of gardens. Constructed from lightweight, UV treated polycarbonate panels and robust aluminium framing for additional strength. For added durability and security, this plastic storage shed can be bolted down to a solid, concrete base. An innovative slide and lock construction system allows for a straightforward installation. UV treating the polycarbonate panels helps to prevent discolouration and cracking, so you can be sure that this garden shed can withstand the test of time. 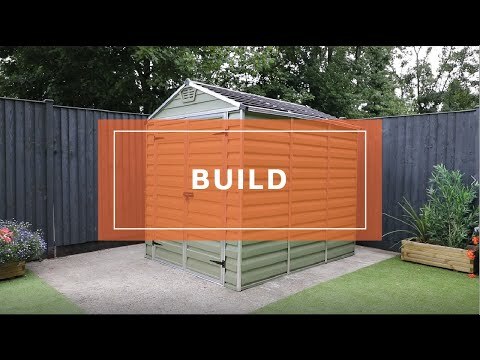 Complete with a 10 year manufacturer’s guarantee, this plastic store is ideal for those looking for a low maintenance garden building. A unique skylight roof allows natural light to filter into the shed, whilst maintaining an opaque exterior, keeping the contents hidden and away from prying eyes. Wide double doors provide easy access and an anti-slip floor is supplied with the garden shed to ensure safe use whilst storing and retrieving items. A pad-bolt is supplied to secure the doors closed. To keep your items dry and protected, integrated air vents encourage air circulation to prevent the build-up of condensation. I am pleased to know that you are happy with the quality of your plastic shed overall and I thank you again for your review! Review:Easy to erect with the help of my 6'3" son. As with others thought the walls flimsy but once fully erected the shed is sturdy. Stood up to the recent strong winds without problems. The amount of light let in by the roof is amazing! I am delighted to know that you are so pleased with the quality of your plastic shed and I thank you so much for your much appreciated feedback! Review:The shed is more flimsy than one we had looked at in B&Q for a similar price. Review:Staff friendly when you needed to speak to them. Driver friendly and courteous. I am so pleased to know that you are happy with both the service and quality of your plastic shed and I thank you again for your positive feedback - it is much appreciated! Review:Needs better/clearer instructions.Definetly needs 2 people to erect it.Could do with vent covers as rain comes in if wind blowing in that direction.Has sharp corners which needs looking at in fabrication but on the whole a decent shed. Our Reply:Thank you for the feedback, much appreciated. Our Reply:Much appreciated - thank you! It is great to know that you are happy with the high quality of your plastic shed and I thank you again for your great review - it is much appreciated. Review:Instructions we could follow and our shed looks good! Review:Quality, easy to build, everything we needed. I am pleased to know that you are happy with the quality of your plastic shed and that assembly was straight forward. Thank you again for your great feedback! Our Reply:It is great to know you are happy with the quality of your plastic shed. I am glad assembly went well and we take your comments on board regarding the instructions. Thank you again for your honest feedback. Review:A bit fiddly to put up , but I was on my own. would have been much easier with two people. Our Reply:Sorry to hear the construction was a little difficult but glad to know that you were able to complete by yourself.